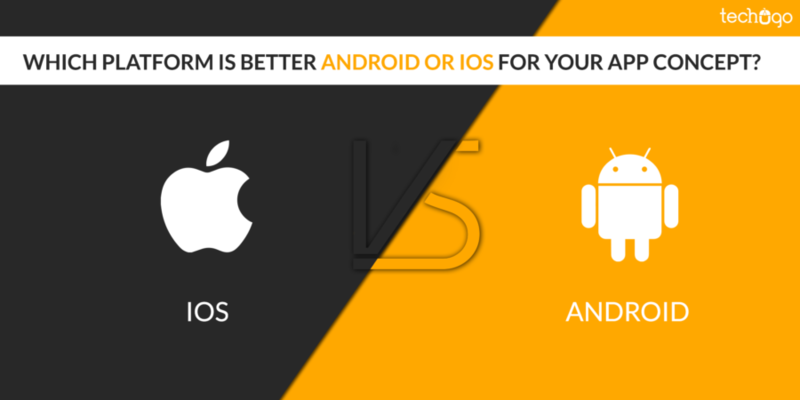 Which Platform Is Better Android Or IOS For Your App Concept? Mobile apps are here to stay for longer and we all are going to benefit from the mobile apps immensely. A mobile app works as a communication tool between the users and the services, helping the users to interact with the business owners to share their reviews, feedback and any other grievances related to service and the product. Mobile apps help the businesses to connect better with their existing and potential user base, but the toughest job on the planet after picking the right mobile app concept is the choosing the right app development platform for your mobile app; Android or iOS. It is IMPORTANT!!! You heard me right; the very first aspect you need to consider just after considering your app concept is identifying your users’ location. The users’ location helps you detect which platform to proceed with. For instance, if your app has a targeted user base in the USA, Europe and Australia then iOS is the best choice, since iOS has a bigger market in these regions, on the other hand, if your user base is from Asia, Africa, and South America than Android must be your priority, since it dominates these regions. Also, you need to research and analyze the demographic demands too, if your app would be chasing business class than picking iOS is the perfect option for you, but if you are targeting the younger generation than picking Android is the suitable choice, due to the less expensive Android devices available in the market. The Smartphone market is flooded with various Android and limited iOS devices, which decide the app development platform at large. A large number of Android devices, lead to hardware variants, wherein developers need to consider the fragmentation challenge not just with one device, but with a variety of devices. In Android app platform, developers need to consider the different types of device used by the users and the different factors like screen size and the resolution would decide the selection process. But on the contrary iOS app development is not tricky due to the similarity of various iOS devices’ sizes in iPhone, iPod, and iPad. Due to various devices on the Android platform, developers need to spend extra time compared to iOS, because there is a myriad of Smartphone and tablets available on the Android platform with different screen sizes and aspect ratios, compelling the developers to develop the app fitting on all the different devices, this process is time-consuming, on the other hand, iOS has different devices, but with the same size, which makes the app development process faster, since developers need to build their app for a narrow range of devices and operating systems. Well, when it comes to development cost there is a game changer, although the Android operating system has a huge number of devices, which may shoot up the cost, but surprisingly it is iOS which is more expensive than Android, since the Apple Developer Account is expensive then Google Play Account and Android Studio can be downloaded on any modern PC, whereas the Xcode needed to design the iOS app, runs only on Mac, and iOS devices which are expensive and in result make the iOS expensive in development than Android. The app testing is the ongoing process in any app development process, regardless of its platform. The app testing is a long process on Android, due to a larger number of Android devices available, so developers need to check the mobile app on different Android devices to make the app bug-free. In iOS, the testing is less complicated than Android due to the limited number of iOS devices. Once the process of app development is accomplished, the next big thing comes on the plate is the App Publishing, which is a task in itself. The Android platform is tad convenient for the developers and let them upload the mobile app on Google Play Store in $25 one-time payment and no long and strict approval process, and the mobile app gets available on the Google Play Store in hours time of publishing, letting the developers run a live beta test or update the app easily. But iOS app publishing doesn’t come easily, it is a tedious process, and every iOS app has to go through a rigid approval process. The process gets the result from a couple of days to sometimes a week to get the approval on the app. Also, the iOS platform charges $100 annually for the iOS app. Considering the above facts, you might think one platform is better than other, but these are the only technical aspects, and each of the platforms has its own advantages and disadvantages, so you need to pick the app platform on the requirements based on your targeted users and the market’s demand only, and not only based on the above mentioned technical aspects, so know your targeted audience and their preferences, interests and your business needs, combining them, pick the most suitable platform for your mobile app. Albeit, I personally believe that more than the app platform, something which is most significant, is the app development company, you choose to develop your mobile app with, because a right mobile app development company always helps you in finding the niche for your business through the developed mobile app, so a healthy collaboration with a top mobile app development company is equally important for your mobile app success. Since there is a burning competition in the mobile app development industry, so selecting a top mobile app development company can be a bit challenging for you, so I have narrowed down the top mobile app development company search result for you, by referring a name of leading mobile app development company, which is none other than Techugo- a Android application Development Company, and a trusted app development partner for many established brands and startups across the globe. If you are looking for a mobile app for your business and willing to know more about Techugo and the achievements we have accomplished, you must get in touch with the Techugo team, since we believe only in quality infused in each of our developed mobile apps. You can get in touch with our team to discuss further your concept to bring into reality. The discussion would help you to gain a better insight of your app requirement.